Mirror design evolves and integrates with new features. A fixed and safe mirror hides a metal storage container that slides left or right to reveal its contents. Customizable with adjustable shelves, this complement is a true “home backstage”, which can also become the star performer at centre stage. Lacquered sheet-iron structure and shelves. 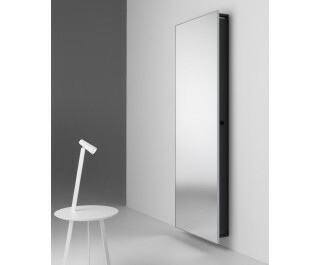 Mirror with non-machined edge, 4 mm thick, protected by self-adhesive polyethylene safety film. In the event of breakage, dangerous shards of glass do not come loose. Frame made from extruded anodized aluminium.